Did you know we had allotments in Ashley Green? Here is the site at the end of the season in December. The site is managed by the Parish Council. There were only EIGHT plots until very recently, and all being worked. However. the National Alloment Association in the UK has an initiative which encourages the splitting of plots into smaller areas so that people are more able to deal with them and keep them tidy. Given that there was a waiting list and because some plots were not being worked properly the Parish Council, with direction from their new Chairman, recently reviewed the position. The result is that several plots have been split into half plots but not all have been allocated. If you would like a plot, or more information, please contact the Clerk to Council at www.ashleygreenparishcouncil.org.uk . Here comes the muck! 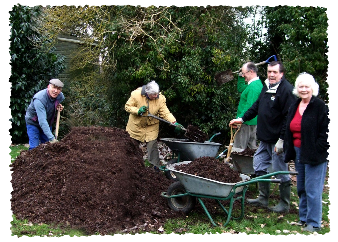 A delivery of manure is quickly barrowed away by the allotmenteers!! just Click ==> MANURE for details. Here is what all the fuss is about! Vegetables grown on the allotments on show at a local village flower show, and winning prizes!! Click on the pictures above to enlarge. The Parish Council has just acquired an old shed via our FREEBAY service for communal use by people without a shed for storage!